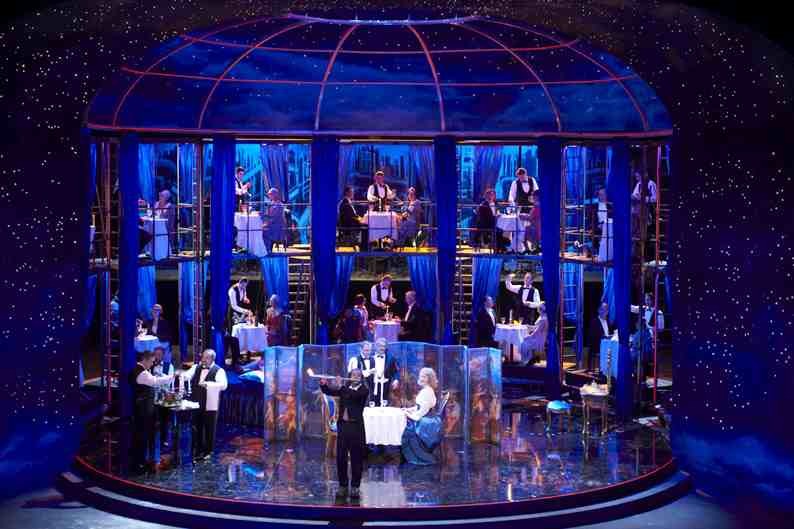 I was quite surprised at some of the set designs in the Volksoper’s other inconsequential production of Leo Fall’s operetta Madame Pompadour. Director/designer Hinrich Horstkotte shamelessly ripped off two sets from Stefan Herheim productions designed by Heike Scheele (who should maybe think about calling her lawyer). Unfortunately the Volksoper has not released photos of either of these sets, the Herheim versions appear above. The first is when a giant head of Pompadour begins to emerge from the stage at the end of Act 1. 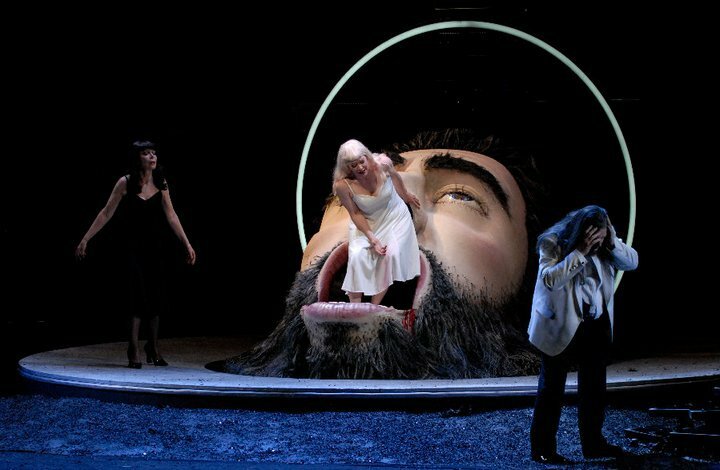 This is a direct echo of the giant head of Jochanaan in Herheim’s Osterfestspiele Salome. Thematic connection? I don’t see one, but trust me, the image is absolutely the same, except for the absence of a silver platter and the presence of a giant bottle of champagne on the top of her head. The second is even more blatant. See, Act 2 had also involved the rest of the giant head and, er, chest of Pompadour. In Act 3, we see the lower part, in curtains whose framework and color are taken from Herheim and Scheele’s Rosenkavalier in Stuttgart. The only addition is the lady Pompadour’s legs. Gotta say I liked the Herheim/Scheele ones better. Perhaps it was meant as a parody of Regietheater? Now that it's been around a while, I suppose one must expect such parodies.